So it’s been seven days since I hiked off Springer Mountain, the beginning of the Appalachian Trail. 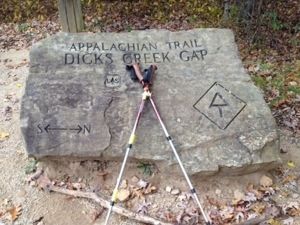 A week later Dicks Creek Gap offered an excellent opportunity for a much needed day of rest, known in the hiker world as a zero – as in nil mileage. 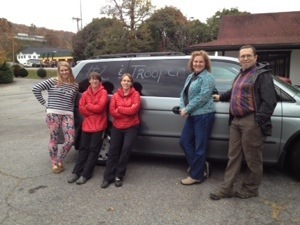 I grabbed a shuttle for the mountain town if Hiawassee and a cheap motel that caters to the hiker trade. A previous blog post entitled “Stolen Sign Epiphany” chronicled a lunch I enjoyed with two hikers from Tennessee whose trail names are Number 2 and Trooper. Number 2 writes a hilarious blog on http://www.trailjournals.com that has become popular. Her entries let me know that there was a very good chance our paths would cross. Back to the cheap motel. I’m closing my door on the way to the on-site coin laundry. Hiker clothes get really funky after a week! I mean I hang my socks on a line in my tent to dry out every night. One night they smelled so bad they actually woke me up! Of course I never gave them a second thought. I kicked them out and went back to sleep. As I closed my door, who should step out of her room but Trooper! “Hey, I know you ” we mutually exclaimed. Her clothes were in the dryer. But there’s more. Number 2’s blog had attracted the attention of a trail angel couple from Augusta, GA. As we gathered outside waiting for our clothes, talking with the angel family, we established on connections with Georgia Tech and hiking. This kind family treated us all to an all you can eat dinner. Thank you! How could a stop for rest get any better than that?